Wolves will assess the fitness of forwards Diogo Jota and Adama Traore. Jota has missed three matches with a hamstring injury, while Traore was substituted because of a similar problem during Saturday’s win at Spurs. Crystal Palace boss Roy Hodgson is expected to make changes to the side beaten by Chelsea, with Max Meyer likely to return and Connor Wickham in contention to start. Christian Benteke remains out with a long-term knee injury. Premier League stats: How 2018 was for your club? @Wilsonfooty: Having each achieved stellar results away from home against one of the big guns over Christmas, it’ll be intriguing to see how Wolves and Palace fare against each other in their first Molineux meeting in six years. Wolves have been an absolutely terrific addition to the Premier League. There’s every chance they could finish a season in the top half of the top flight for the first time since 1980. However, Palace will take heart from the fact that Wolves have lost four of their last six home games. The Eagles – who have scored as many goals in their last two games away from home as they have all season at Selhurst Park – seem to prefer life on the road. Wolverhampton Wanderers head coach Nuno Espirito Santo: “We are back at Molineux. The home factor of the competition is very important, but it will be tough because Crystal Palace are a very good team. Crystal Palace manager Roy Hodgson on his side’s poor scoring record: “As far as I know, there’s not one team in the bottom seven or eight that has a good record in front of goal. “One or two may have scored more than us but we’re all pretty much in the same ballpark. And the fact that we have the best goal difference of those teams is down to the fact that we haven’t conceded many, so that’s why we’re on minus nine and the next best team around us has minus twelve. Wolves have lost only one of their past 12 top-flight matches against Crystal Palace, a 1-0 away defeat in January 1980. Palace are winless in all six top-flight visits to Molineux, their longest away run without ever beating an opponent. 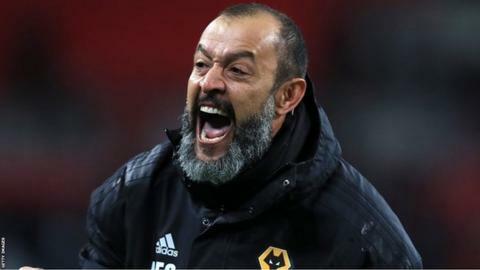 Wolves earned 13 points from their last six games of 2018 – only Liverpool and Tottenham fared better over the same period. If they avoid defeat on Wednesday, Wolves will become the first promoted team to have at least 30 points after 21 fixtures since Birmingham in 2009-10. The last time Wolves had 30 points or more after 21 top-flight matches was in 1979-80, when they finished sixth. They have not lost their opening league match of a calendar year since 2013, when beaten 3-1 at Crystal Palace in the Championship on New Year’s Day. Their tally of five first-half goals is the lowest in the division. Palace’s defeat against Chelsea on Sunday ended their three-match unbeaten run. They could fail to score in three successive league matches within a season for the first time since the opening three matches under Roy Hodgson in 2017-18. The Eagles have failed to score in nine league games in total, a joint league-high with Fulham and Huddersfield. Crystal Palace have earned 10 points in away matches this season, one more than at home. Wilfried Zaha has neither scored or assisted a Premier League goal in his last 11 appearances.